It’s partially renovated. It’s cute. What to do? 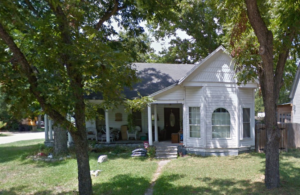 We partnered with our friends at Andress & 3, LLC on this older home in Cameron, Texas. The owners were in the middle of a renovation, but had to move. Larry found and negotiated the deal. We found the money. Together, we got it at a great price. There were many exit strategies possible for this property. In the end, we decided to sell the house to another real estate redeveloper, and were able to make a profit with no other effort. Worked for us! Worked for the buyer, too. As of this writing, he’s selling it as an owner financed property. As far as I know, he hasn’t done any additional work on the house either. When he finds the right buyer, it will be a great opportunity for someone who needs an affordable house in Cameron they can buy and fix up themselves.